Tuesday, in the midst of their opening round playoff series versus the Clippers, the Spurs relocated from the team's beachfront hotel in Santa Monica to the Ritz-Carlton, Los Angeles, situated across the street from Staples Center. Wednesday morning, the Spurs departed the Ritz shortly before 10:00, prior to taking the very short bus ride to Staples for shootaround. On the walk to the bus, some of the iconic franchise's biggest names stopped to interact with fans. 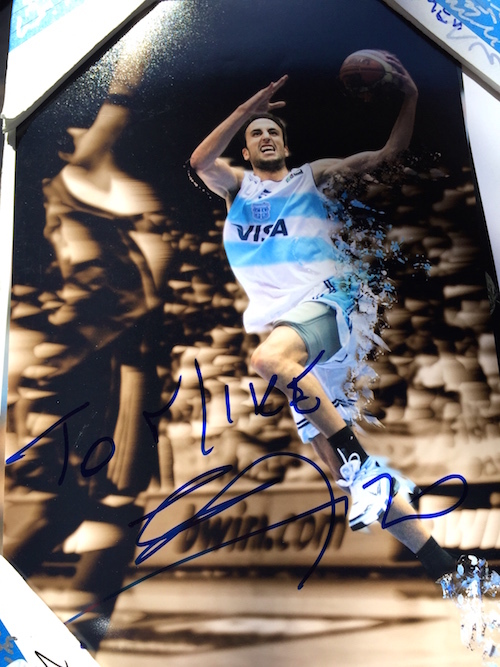 One of those fans submitted the above photo autographed by Manu Ginobili. Ginobili remains one of the classiest and fan friendly players in the NBA.